Click the green print button on any active window to print it instantly. Image-capture applications are ten-a-penny, but they all perform “soft” captures, capturing entire screens or – depending on their capabilities – windows, applications or selected regions to image files. Printing these out is easy enough, but Hardcopy is designed for the person who wants to quickly print the contents of their desktop with little or no fuss. Once installed, you’ll find the [Print Screen] key now does exactly what it says: it prints the screen to your printer. You’ll also notice a new green button appear on any active window, right next to the minimise, maximise and close buttons. Pressing this will print that window instead of the entire screen, an action you can also achieve by holding [Alt] + [Print Screen]. 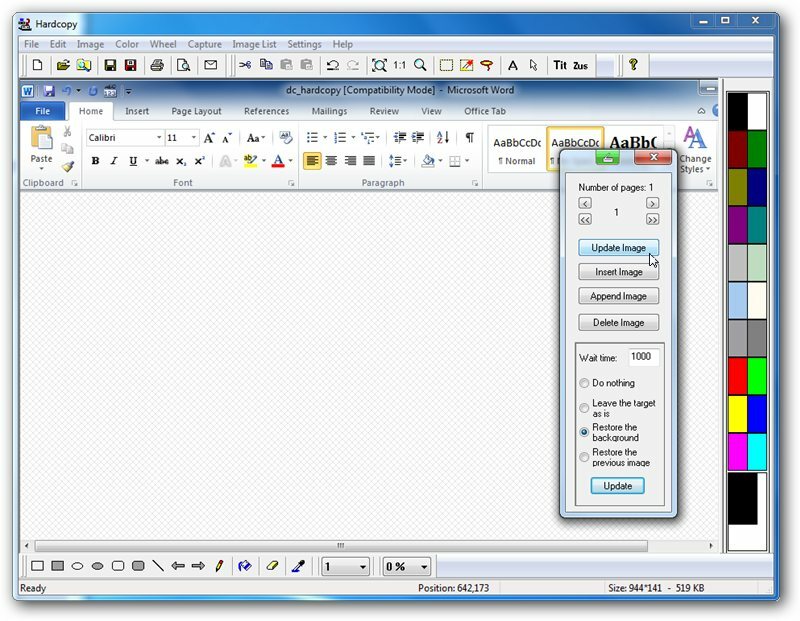 On its own this is potentially useful, but Hardcopy also bundles a fully functional screen-grabbing and editing tool. Locate its Taskbar Notification area icon, right-click and you also have the option of capturing objects and rectangular selections as well as the other two options. Unlike the main features, however, these selections aren’t sent directly to your printer – instead they’ll pop up in the Hardcopy editing window, where you can perform extra tweaks such as adding a title, annotating the captured image or performing colour corrections. You’ll even find an option under the Capture menu for plundering resources like bitmaps and icons from EXE and DLL files. The options on offer are truly mind-boggling, but thankfully it’s the kind of program you can explore at your leisure, tapping into its many options and features as you learn the basics. Although free, registering the software unlocks more features. Hardcopy will also allow you to save your captures as regular image files – a mind-boggling array of formats are supported – but its main principle is providing screen printing facilities, and in that event, it excels. What's new in 2019.03.20 (see the changelog for more info)? - Optional support of 64 bit MAPI. The MAPI 64-bit support can be turned on with "Settings → Options → Intern", select "PS Mail". Hardcopy does its primary task well, and bundles lots of extra useful functionality too.